Here it is the middle of March and I’m still do well with my eating better and exercising goals in 2016. Every week I go to aerobics, the gym, and stay after work for an exercise class. I’ve been eating balanced meals and have been staying hydrated with water. I think one of the best things I’m been doing is to reward myself with a small indulgence each day. One of my favorite “better for me” snack options is DOVE® Chocolate Fruit & Nut. In the past I’ve enjoyed DOVE® Dark Chocolate Cranberries as a sweet snack option. I love that it combines the wellness benefits of dark chocolate with dried cranberries for a tasty snack that helps curb my sweets cravings. So imagine how happy I was when I saw that they now make DOVE® Chocolate Fruit & Nut. 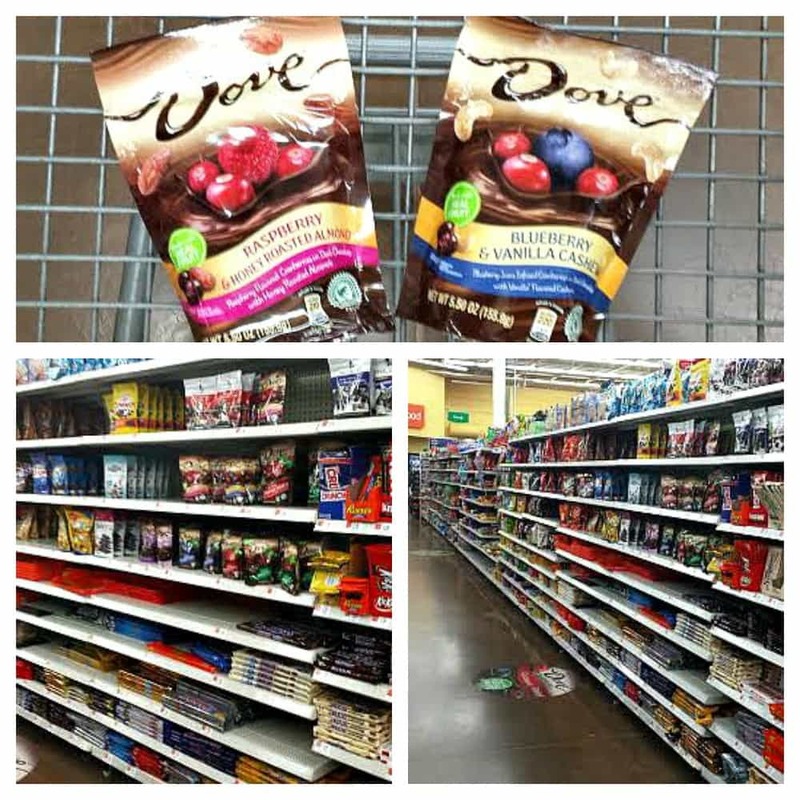 When I was in my local Walmart last week I was looking for the chocolate cranberries when I saw several new flavors! I love almonds and often snack on DOVE® Roasted Almonds covered in Milk Chocolate before my aerobics class so when I saw that Walmart had DOVE® Dark Chocolate Raspberry & Honey Roasted Almond I quickly bought a bag to use as my pre-aerobics snack. I also purchased a bag of the DOVE® Dark Chocolate Blueberry & Vanilla Cashew because vanilla cashews sounded amazing. Can I tell you how much I love these new flavors? Just a small handful of the DOVE® Dark Chocolate Raspberry & Honey Roasted Almond before aerobics keeps me from snacking on chips or a candy bar. I love the combination of dark chocolate paired with raspberries because lets be honest, berries and chocolate were meant for each other! Then you add in the crunchy and slightly salty almonds and I’m in love! Sweet, salty, and chocolate can’t be beat. Since I have a hard time buying a new product and not baking with it I immediately started coming up with ideas. I wanted to bake something that would be a great snack before my workout or after a long day at work. For some reason I kept coming back to pairing the DOVE® Chocolate Fruit & Nut with oats. When I think of oats I think of oatmeal cookies and then I realized it would be fun to hide the DOVE® Chocolate Fruit & Nut inside of an oatmeal raisin cookie! 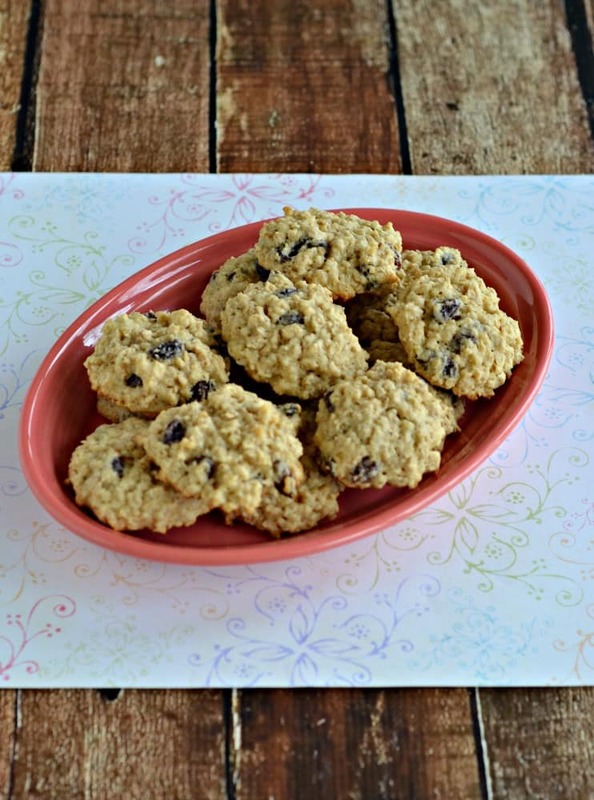 I quickly whipped up a batch of my favorite oatmeal raisin cookies. I divided the dough into 2 piles so I could have two different surprises in the middle of my cookies. I figured it might be fun to taste both of the cookies and see which one we liked better. 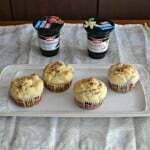 I knew they were going to be delicious, especially with the DOVE® Chocolate Fruit & Nut as the surprise in the middle! I found that the best way to do this was to put the surprise filling in the middle of a ball of cookie dough, place it on a cookie sheet, and then refrigerate it for 30 minutes before baking. This helped the cookie to keep it’s shape and really hide the surprise inside. The first bite of these cookies was pure bliss. 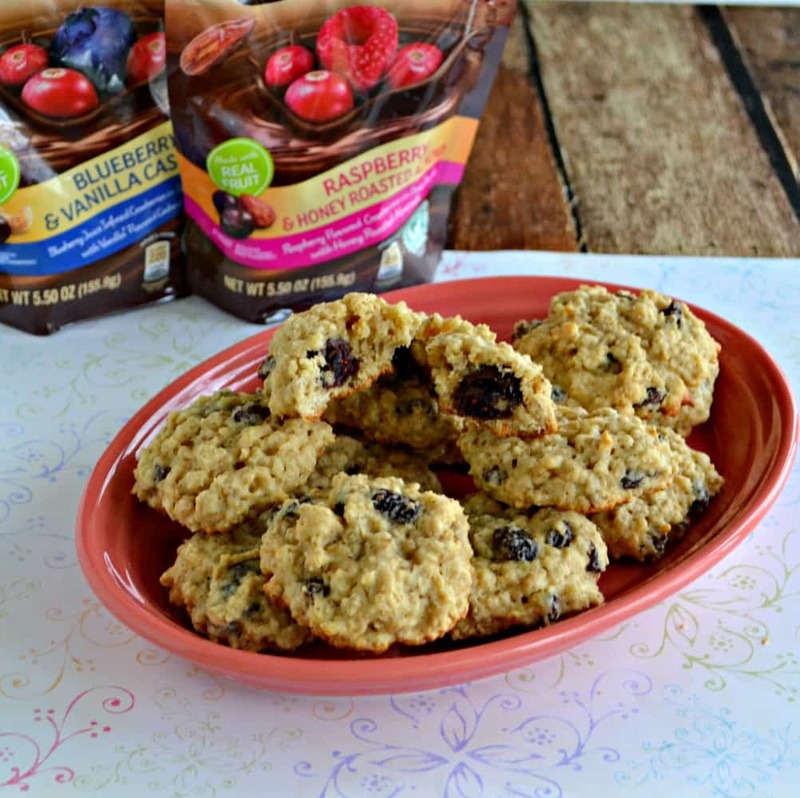 Oats, chocolate, fruit, and nuts all combined into one delicious cookie! 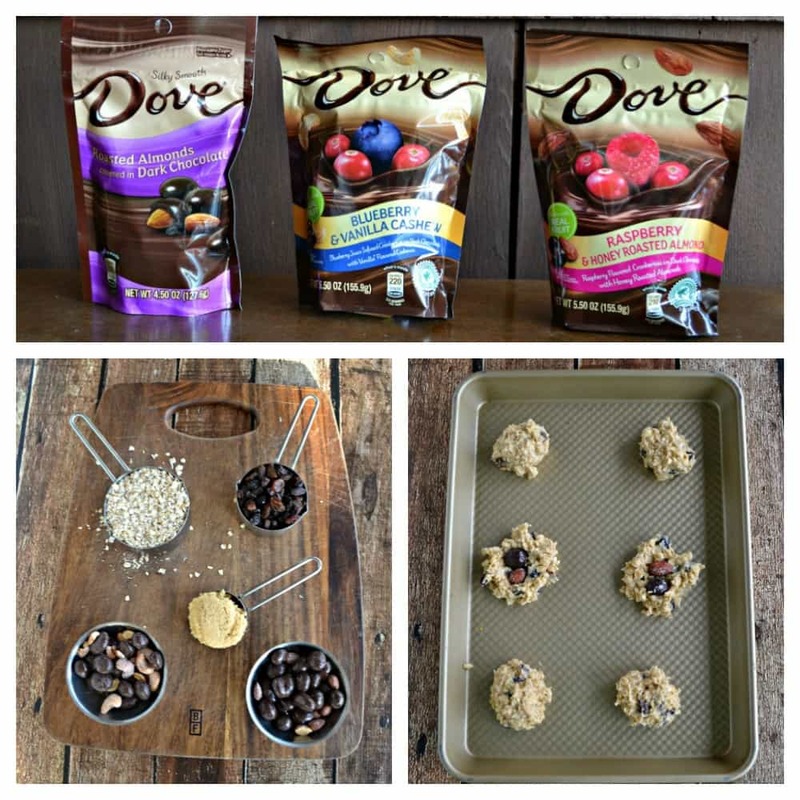 While I liked the cookies with the DOVE® Dark Chocolate Raspberry & Honey Roasted Almond I was surprised to find out my favorite were the cookies with the DOVE® Dark Chocolate Blueberry & Vanilla Cashew inside! 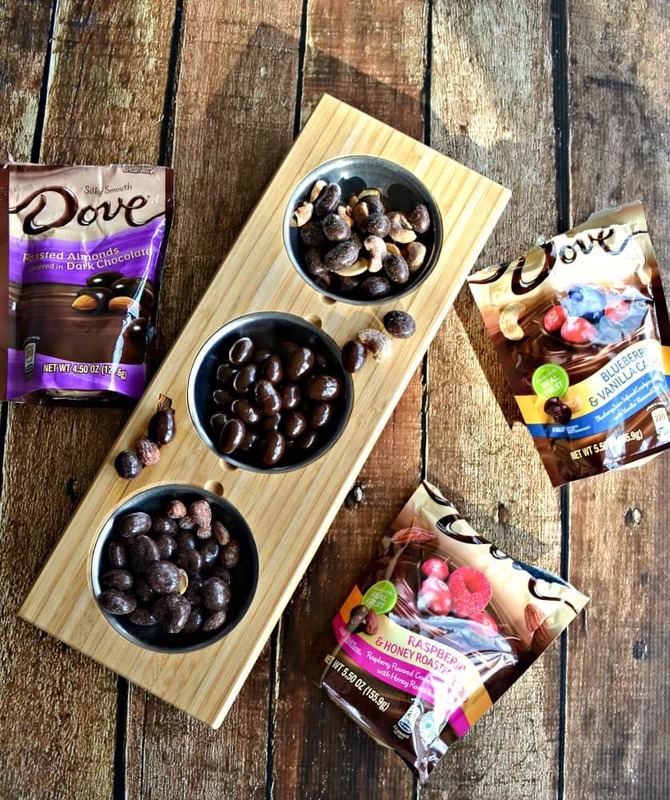 Do you want to try DOVE® Chocolate Fruit & Nut for yourself? Head over to Walmart this and look for the special in store display this month! Be sure to clip THIS coupon to save $1.00 off the purchase of 2 DOVE® Chocolate Fruit & Nut. In a large bowl combine the flour, oats, baking powder, salt, and cinnamon. Set aside. 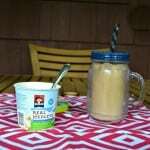 In a medium bowl cream together the butter, Greek yogurt, sugar, and brown sugar. Add in the egg and vanilla and mix well. Pour the wet ingredients into the dry ingredients and mix to combine. Fold in the raisins. Divide the dough in half. 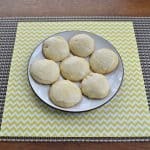 Roll 10 balls with each half of the dough. Divide the DOVE® Dark Chocolate Blueberry & Vanilla Cashew between half of the dough balls, placing them in the center of the dough. Using your hands, put the dough around the fruit and nuts so that they are not showing then place on a cookie sheet. Repeat with the other half of the dough and the DOVE® Dark Chocolate Raspberry & Honey Roasted Almond. Refrigerate the cookie dough balls for 20 minutes. Bake for 14-16 minutes or until they are brown. Remove from the oven and let cool for 2 minutes before removing them to a cooling rack to cool completely. Now for the real question, which DOVE® Chocolate Fruit & Nut do you want to try? DOVE® Dark Chocolate Raspberry & Honey Roasted Almond, DOVE® Dark Chocolate Blueberry & Vanilla Cashew, or DOVE® Dark Chocolate Strawberry & Cocoa Almond? It’s great! It gives me some energy and a little incentive to get to the gym!